^^^Yes. Uptown is surrounded on all sides by freeways, and neighborhoods on three sides of uptown are managing to grow with those freeways intact. The Northside has so much rail infrastructure, and I believe that is the true impediment to the North End neighborhoods developing in the same manner as their counterparts on the other sides of the beltway have. If the city wants to go for a home run on the northern fringes of center city with an infrastructure project, they should consider working with Norfolk Southern to move the entire switch yard onto airport grounds, (rather than razing Brookshire) even if they have to pick up a significant portion of the tab. This would free up 150-200 acres for redevelopment rather than 5-10 acres like razing Brookshire would. It would allow for the reestablishment of a street grid in the area and could bridge the gap between the neighborhoods west of the rail yard and those east of the rail yard. Additionally, in the long run it could even be profitable for the city not just from a neighborhood building standpoint, but a financial standpoint as well. The city could probably make $100 million+ on the sale of land alone. Coupling that with an almost certain rise in tax revenue due to appreciating property values, and this could, over a few decades, actually produce a positive ROI. Of course, this idea is very much unrealistic considering the state is doubling down on the building of rail infrastructure in the area.. As part of the STIP, the state is partnering with Norfolk Southern to bring a bulk transfer terminal-for ethanol I believe- to the site of the former intermodal yard. As an aside, I thought part of the reason for moving the intermodal terminal to the airport was to remove trucks from the roads around downtown. Once this facility is built, trucks will return, only this time pulling tank trailers rather than containers. It seems kind of foolish to replace one rail-to-truck facility with another if one of the stated goals is to actually remove truck traffic from downtown streets. Sometimes government agencies just really seem to be 100% clueless. 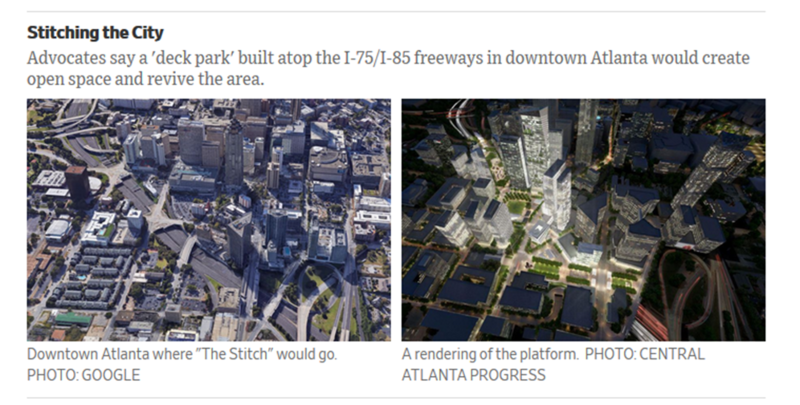 WSJ reports that Atlanta is discussing several caps over their long list of freeways. No mentions of developing the new RE, it appears to be penciled to be all parkland. Another plan with an estimated $250 million price tag proposes covering part of busy Georgia State Route 400 near a shopping mall. A third would cover portions of the connected Interstates 75 and 85 near Georgia Tech and Midtown Atlanta. FWIW the Belk carries just 82,000 cars per day. Perhaps just closing it would be cheaper than a cap. I am all for that! Connect downtown with Dilworth, Cherry, Elizabeth, Chantilly! Now you're talking! Can we close I-77 as well? Or too far? I think there do need to be some regional/national interstates like 40, 77, 85, 95, etc to allow for easy travel between cities. However, interstates and other limited-access roads that run through city cores should probably begin to be removed. I suppose re-routing I-77 onto the west side of I-485 wouldn't be terribly confusing or difficult, but I don't think it should be removed from the face of the earth if that makes sense. This was the original concept for interstates. The system was not conceived for daily commuter intracity travel, but intercity connections over long distances. The Interstate system was also not originally conceived to include lines routing through the heart of cities across the country. Induced demand works both ways — build it and they will come, take it away and they will go away. I'm all for tearing up 277, at least partly (the southern half can go, but I don't think it's realistic to remove both halves, especially since the DOT is currently working on the northern half). I'm sure the NCDOT will find it easier to cap over 277 than to repair the hundreds and hundreds of non-working streetlights along the highway that haven't functioned in the last 15 or 20 years. I'm not necessarily against closing it down, but don't confuse a temporary effect for a permanent one. For example quite a few people are telecommuting. which isn't a permanent solution for most employees. Also traffic doesn't just disappear it is re-routed. Though if well designed some of it should be able to be mode shifted. The sad thing is the state spent 400 million on the Independence Expressway, which does very little to actually help Mecklenburg County. Meaning it doesn't allow greater density all that much, which in turn limits the tax base. I'm not saying that the Independence project is a bad one, but that is right about the same funding on the state level for the silver line, which likely would not require continued state funding for maintenance. I bring that up because if we had the silver line in place then we would have quite a bit of infrastructure in place to allow mode shifting possibly allowing the removal or boulevardization of the Belk/Brookshire. The sad thing is the state spent 400 million on the Independence Expressway, which does very little to actually help Mecklenburg County. Meaning it doesn't allow greater density all that much, which in turn limits the tax base. Worse still, more than half of those hundreds or millions spent was on right-of-way, or basically, removing tax base. I think the portion between 74 and 85 is pretty important. Certainly think you could close the south portion tho. What's more, that northern half along N Davidson, Calwdwell, are ideal for caps. Even if not a full cap, at least wider "green shoulders" for a park-like bike/ped path. Currently 11th and 12th street are needlessly miserable to traverse and those would help. It's never getting closed. Maybe it'll become a boulevard someday but it's not going away. I just don't see how South End and southern end of uptown dont become a major cluster eff in the process. Meanwhile the Brookshire traffic would double. Hey, I cant stand it either but it does its job quite well. Funneling traffic in and out of uptown quite efficiently. From Atlanta GA about their freeway cap the Stitch. $400 million cost for 14 acre park? My view for Charlotte we should buy up more vacant or underused land in uptown for parks way before we should or could spend this kind of money for a cap. If uptown needs more parks lets acquire land or set aside land that is already owned by the local govt. like the Hal Marshall Center before we do something like this. Just too expensive. Maybe in 30-40 years from now. This is questionable for even the ATL now. My view for Charlotte we should buy up more vacant or underused land in uptown for parks way before we should or could spend this kind of money for a cap. If uptown needs more parks lets acquire land or set aside land that is already owned by the local govt. like the Hal Marshall Center before we do something like this. Just too expensive. Maybe in 30-40 years from now. The Denver park cover plans. From the ATL that is down there in Georgia the cap called the Stitch the projected cost is now $450 Million! But here is a cool video about it. I am 110% opposed to this in Charlotte over 277 until all the land is developed with the loop and only after more parks are added. Imagine the parks and greenways and a signature pedestrian bridge Charlotte could build with 1/4 of that amount of money. My bet this will not happen in the next 20 years even in Atlanta. I agree with KJ, I think there are far more important uses for the kind of money it would take to cap 277. I wish they would at least widen the sidewalks and/or add bike lanes for more of the bridges into uptown though. Right now the only one that feels even remotely pedestrian-friendly is Tryon, and even that one isn't great. Maybe the impact of all the workers at LU will prompt a change at the Church St. overpass. I agree hopefully with the rail trail being extending into uptown that will help. But the quickest way is to give some of the bridges a diet and expand the sidewalks for example south Church and College street bridges which I have walked a lot. The sidewalk is narrow and people are racing in or out of town. It probably wasn't even 10 years ago that Tryon's bridge was given a road diet and the new, wider stamped concrete sidewalks. It used to be just as ratty as the Church Street bridge!